Kingdom of Saudi Arabia, Riyadh, 13 November 2018: flynas, the Saudi national air carrier and leading low-cost airline in the middle east, took delivery of its first Airbus A320neo Aircraft, the first of its kind in the Kingdom, on Tuesday 13 November 2018. The ceremony was held in the Private Aviation Lounge at King Khalid International Airport, Riyadh, in the presence of HE Mr. Abdul Hakim Al Tamimi, Chairman of the Civil Aviation Authority, Mr. Ayed Al-Jeaid, Chairman of the Board of Directors of flynas, along with a number of executive directors, influencers and media professionals. In this regard, Mr. Bander Al-Mohanna, Chief Executive Officer of flynas, said, “We are very pleased with the successes and achievements that was achieved since the inception of flynas, as it has won many international and regional awards by providing the best services to our guests”. He added, “we are celebrating the reception and delivery of our first Airbus A320neo aircraft as part of our agreement with Airbus in 2017 to purchase 120 new A320neo aircraft with a total value of SR 32 billion, the second largest aircraft purchase in the Middle East, noting that it is a major strategic step of flynas that would change the air transport map in Saudi Arabia and the Middle East. Mr. Al-Mohanna stated, “flynas chose Airbus A320neo for its modern, professional and efficient operating standards, which will enable flynas to travel long distances and reach new destinations to meet the growing demand in the Saudi aviation market”. He added, “We chose the passenger cabin for the economy class to be very convenient and comfortable by increasing the space between seats and selecting a distinctive and high-quality type of seats in line with the expectations of our passengers, as this type of seat is the first of its kind for an airline". He pointed out, “Over the next two years, flynas will be able to convert 50% of its aircraft to the new A320neo, and we will introduce new models to be announced later, to contribute to the realization of the Kingdom's Vision 2030, which aimed at developing the aviation sector in our beloved kingdom”. He concluded by saying, “today in flynas, we have the right to be proud of our achievements, as flynas has won several international awards such as Skytrax for 2017 and 2018 and the World Travel Award for for Middle East’s Leading Low-Cost Airline for four consecutive years, and today flynas is taking delivery of its first Airbus A320neo”. 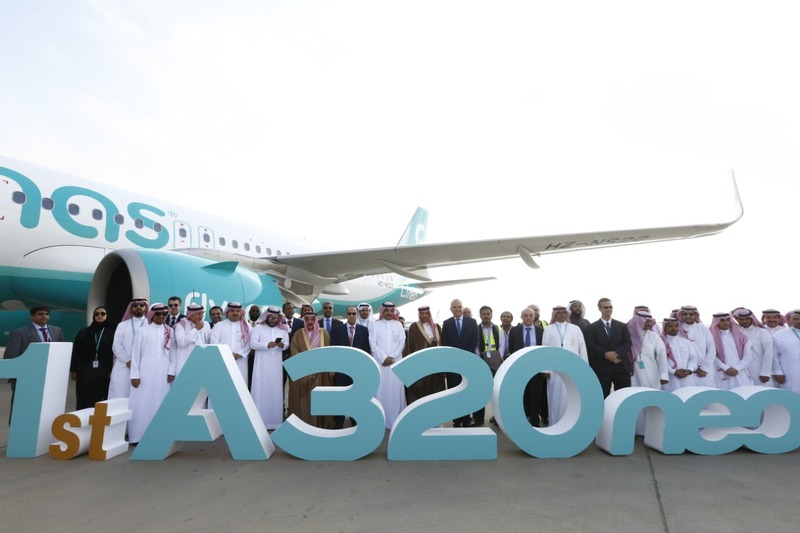 It’s worth mentioning that flynas has signed an agreement with Airbus to purchase 120 A320neo aircraft with a total value of SR 32 billion, where it was agreed to purchase 80 aircraft before 2026.